For this UMass Lowell AES meeting, former Sound Recording Technology Graduate student Bradford Swanson shared a research project regarding the subjective comparison of vocal microphones on various sources. While most engineers learn to understand the differences between microphones through practical use, some microphone companies such as Shure and Rode have developed web applications for comparing timbral qualities of their microphones. Often, these online resources are less than ideal due to variations in performance between each test, and the lack of a scientific control. Brad’s research involved developing a system by which microphones could be used/tested, with the results available for quick comparison all in one online resource. arranged in 12 groups of 3-5 per performance. A diverse selection including dynamic, small/large diaphragm condenser, and tube condenser microphones were all part of the groups tested. Different settings for each individual mic were also tested. Brad’s presentation detailed the exhaustive process of recording the samples as well as the rigorous preparation required to ensure an honest and accurate scientific experiment. Long before the culminating research/recording session, Brad had to analyze the signal chain for imprecision and technical malfunction. If certain microphones did not perform up to snuff in these original tests, they were either fixed or disqualified from the study (hence the absence of the of UML’s well weathered U87). Brad admitted that this project encompassed just a fraction of the available vocal microphones available to engineers today, not to mention the multitude of microphone applications that remain unexamined. This meeting we had the pleasure of hosting guest lecturer John Hanlon, an accomplished recording/mixing engineer, most notable for working with Neil Young. Fresh out of sessions for Neil Young and Crazy Horse’s latest record, “Americana”, John presented to us an intimate gaze into what went into the completely nontraditional sessions. Starting with the months of pre-production, to the puzzle of setting up a live to multi-track session in Young’s house, John took us through what went into satisfying Young’s expectations. Using pictures and diagrams, he revealed how he set up a typical living room space to record an entire band, including drums and vocals, all playing at once. *This included monitors that reinforced the vocals, and a subwoofer reinforcing the kick drum. On top of that, he described the control room, set up in a bedroom. This featured several vintage analog consoles, tape machines, a pro-tools rig, and outboard gear. While a signal flow nightmare, John was able to maintain an organized studio. Extensive planning, pre-production, and having a dependable, hard-working assistant were all credited to the success of the sessions. We were lucky enough to hear a sneak preview of the record, including tracks from the blu-ray disc with 24bit, 192kHz audio. From the listening, it was clear that the extreme tracking method was not just to satisfy Young’s requests, as the sonic character lent by the vintage gear resulted in a uniquely raw sound. We’d like to thank John Hanlon for coming and sharing his expertise and experiences. It truly provided us all with a new perspective on how recordings can be made. developed during his studies at UMass Lowell. As a concert recordist, Jamie was dissatisfied with the spatial qualities of standard stereo miking techniques and wanted to find a way to improve image, realism and flexibility in his recordings. 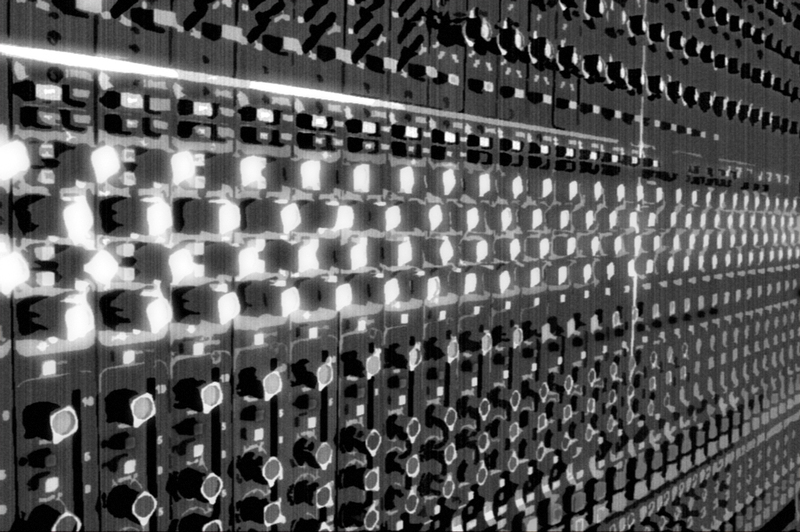 Jamie’s research resulted in a 4 microphone array consisting of two stereo pairs, one facing the performers and one away. Each pair resembles an ORTF setup. The angles between each front mic and each rear mic can be varied to gain the desired balance of direct and ambient information. The left and right microphone of each pair can be set at either 17cm or 30cm depending on the desired sound. A more detailed analysis of these measurements can be found in Jamie’s engineering brief on the AES Library. After describing the technique and its development, Jamie demonstrated some recorded material in both stereo and surround. Lastly, he allowed audience members to interact with mixes of three different recordings he made using STAAG to fully realize the capabilities of the different pairs of microphones. This first hand experience greatly helped our understanding of the technique and solidified an already convincing argument. Many thanks to Jamie for the enthusiastic pursuit of audio knowledge and for sharing this with us. What a turnout for the first meeting of the school year! The officers started the meeting by introducing themselves, and explaining a little about the UML Audio Engineering Society to new and returning members. Questions were answered, t-shirts were sold, and the crowd was re-assured that our meetings are open to the public and that no commitment from meeting to meeting is required. Other business or activities at the meeting: Closing semester sentiments and thanks for a great year of UML SRT AES events! During this meeting, second year grad student Nick Foudi gave a presentation of his Master’s Thesis. His focus was on automatic mixing, whereby code he developed in Matlab has exclusive control over mix parameters from multi-track to stereo. He introduced the concept as not necessarily a way to get rid of a sound engineer’s job, but to simply make it easier and faster. He described similar projects that have attempted the same goals, and pointed out some of the flaws that he wished to overcome in his own algorithms. Describing how his program works, he first mentions that at this point, it only takes care of compression and it won’t add any EQ, reverb, or effects. It decides each track’s compression parameters based on a key track, which is designated based on an evaluation of all tracks dynamic range, seeking out the one with the least variation. The other tracks follow an algorithm based upon the model track that manipulated their dynamics. Nick played back a few examples of before/after mixes with and without his program; no other processing was used. It was clear, and everyone in attendance who spoke up agreed, that the program improved the mix. In Many cases, tracks that were originally buried came through the mix well after the auto-mix processing. Also, it was apparent that the program worked better with some songs/genres than others, as each have their own general trend/style of dynamics and instrument balances. Overall, it is a very interesting and impressive program, and leaves us wondering if auto-mixing programs will be a regular part of the industry in years to come. However, it was made clear at this meeting how complicated auto-mixing is, and where many improvements can be made in future processing schemes. Meeting Topic: UML SRT Listening Session in Durgin 114!! Other business or activities at the meeting: General discussion of sessions, studios, and current equipment issues. Overall a casual end-of-semester decompression. Meeting Topic: Filed Trip to Gateway Mastering!! Other business or activities at the meeting: None. This meeting consisted of a field trip to the famed mastering house and workplace of UML Alumni Adam Ayan (and Bob Ludwig), who took us on a tour of the facility and discussed current trends in mastering. Adam discussed media types, transfer methods, shared many examples of his work ranging from independent bands to be released on iTunes to the Rock and Roll Hall of Fame Concert in surround for Blu-Ray. The majority of the trip was spent openly asking questions and picking Adam’s brain about mastering techniques, gear, and the music business in general. Topics also included ear training techniques to monitor types to business practices and the average workday. Ayan demonstrated the difference that mastering makes with audio examples from before and after the process. Debunking the misconception that mastering is just about making things louder, Ayan contrasted several song samples, one of which was entirely unmastered, one of which was fully mastered and the final simply raised up 8dB. The difference were startling and illuminating to just what the mastering process does. We are extremely grateful to be welcomed to such a wonderful audio haven and would like to thank Adam Ayan Bob Ludwig for sharing their world.